While the cows will have been sent back to the farm and the last corn dog slowly but surely digested (just) the legacy of this years cookery competition is still lingering. This would have been my third year competing but alas at the last moment I wasn’t able to get my “cookery” act together and failed to get all items ready, to my satisfaction, for judging in time. There will always be next year. As usual the way in the which the items are judged was hotly debated prior to the results being announced, but what added to this year’s perplexities (judging is predominately held behind closed doors) was an article in The Age newspaper, centred around sponges. To set the scene, after last year, where I felt my biscuits were of a very good standard, I failed to win any prizes. 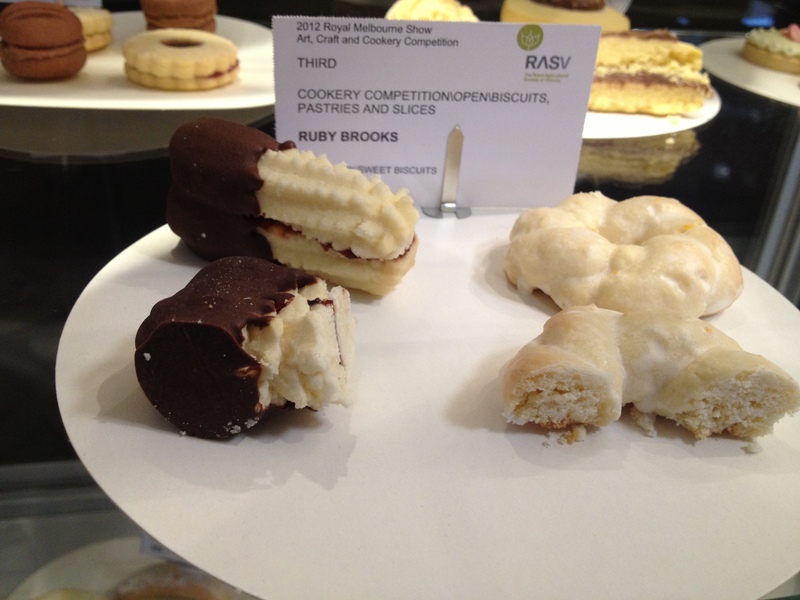 I don’t have hard feelings, but was interested that this year biscuits were separated into “fancy” and “plain”. Clearly the judges felt that the two are very distinct disciplines and as such should be judged and presented separately. They have also separated cupcakes into “decorated” and “iced”, all of which is open to interpretation because the CWA does not give detailed guidelines to help you prepare your entries. I asked for feed back last year about my entries or at least the criteria by which items are judged and I got no feedback about my entries but received a generic print out that gave some indication about the judging, but notes like “not burnt” and “even colouring” were not helpful. This year I made a point of looking at the list of names per section to see whether it would be an onerous task to write down feedback and for it to be sent to the entrant upon request and the most number of entries were about 8 or dozen, so I kind of think this is do-able. Back to that article in The Age, it was centred on the sponge section of the cookery competition and more particularly around Angela Fleay (a consistent winner in many categories) and her sponge recipe that has been passed down to her children, such an impressive recipe that her son won first prize with it this year. Whilst it’s mildly charming that a singular family has seemingly prodigious talents in the kitchen that they take out section upon section, the question I have is for the judges. Ms Flaey expouses the virtue of using supermarket bought eggs as the yolk is pale and the judges prefer a “pale” sponge, god forbid we use free range or organic yellow eggs! Frankly if the palate of the judges is something that prefers rancid butter from the supermarket shelf or baking that has been frozen in advance and thawed or not even trying to use local made or sourced ingredients then what’s the point? 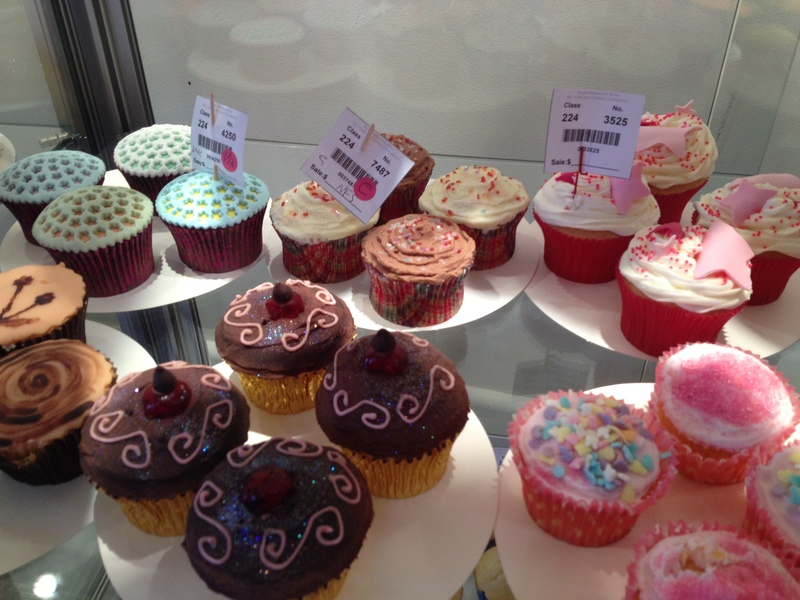 The question for the judges and judging was no more evident that in the decorated cupcake section. Firstly NONE of the cakes were cut, so why even bake! Silly me, when I’ve entered previously I assumed the entire cake would be tasted and that the decoration flavour and texture would be as much a part of the eating experience as well as the tastefulness of the decoration visually. I ask you reader to look at the photos of the cupcakes that won a prize in decoration and tell me your thoughts I personally don’t think they meet today’s aesthetics and this is partly the space in which the judges heads need to get. 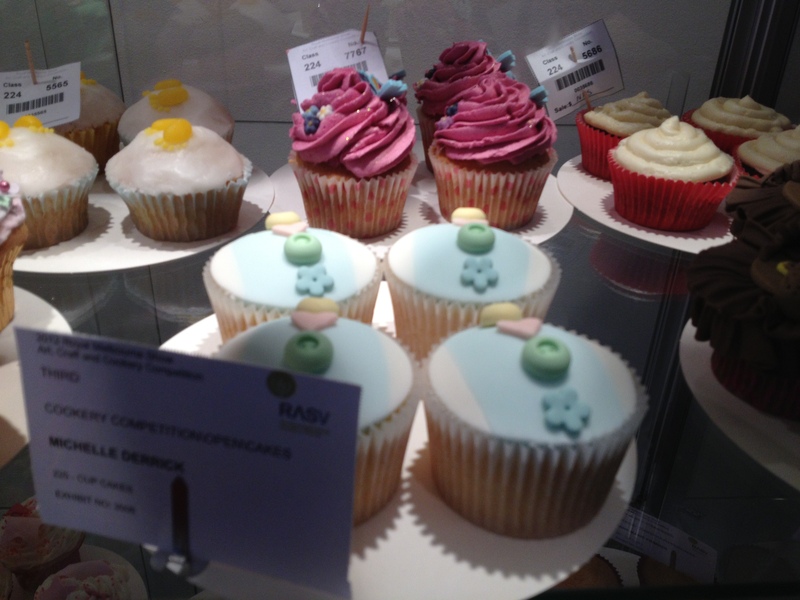 The cupcakes pictured above came second, they are by Anne-Marie Primmer, another person that has seemingly cornered the “competitive cookery” market. 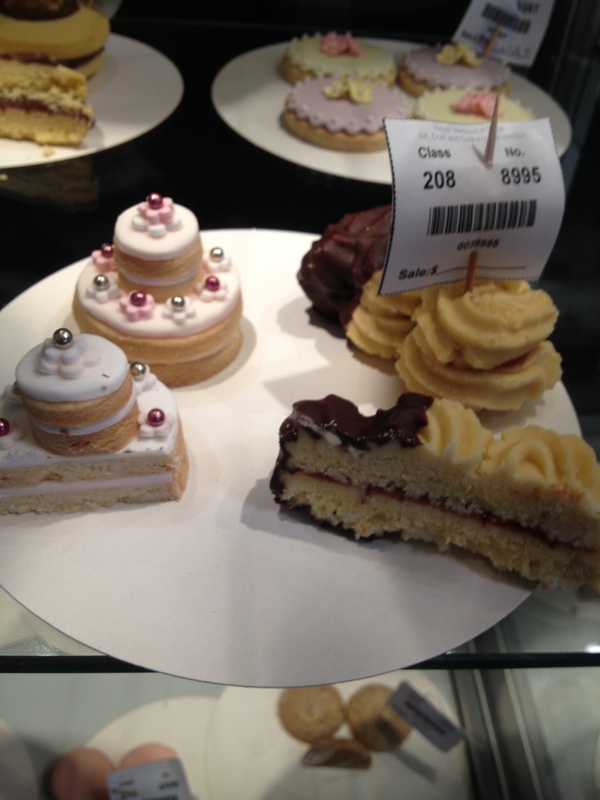 I’ll get to the point judges, these are NOT decorated they are novelty plain and simple – decorated means edible and tasteful and frankly these are neither. Who would want to eat all that fondant on top, ah yes, a 4 year old and even then they would struggle. If the category is decorated to me that doesn’t mean novelty, the instructions say “tasteful”. Ok, now I’m getting a little ranty. On to biscuits, the section I covet a prize in. The article in The Age also claimed that the judges felt this year’s entries were low in quality, I tend to agree judging by the very poorly, store bought, decorations on the cupcakes as pictured above. 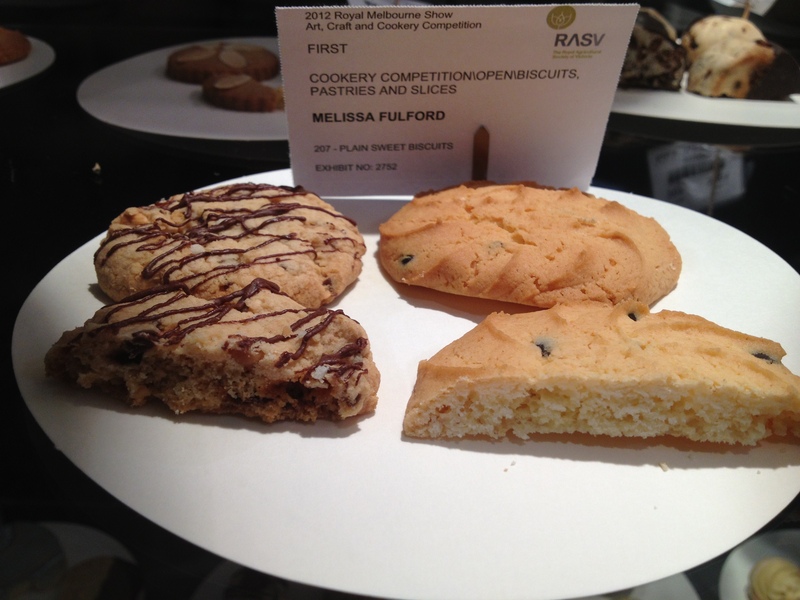 Ok, so above we have first prize in plain sweet biscuits. The biscuit to the left is a passionfruit butter based biscuit, whilst the colouring looks even the mixture is too soft and I can tell that because it’s been piped but spread as the piped shape has not been held in the oven. Also, the texture of that biscuit looks uneven for a butter based biscuit, but perhaps it’s a few days old and the changed since judges tasted it. The biscuit to the left is a chocolate chip biscuit that makes me feel very sad. Just look at that haphazard chocolate drizzle, boy it must have been mindblowing or the rest of the entries dire. 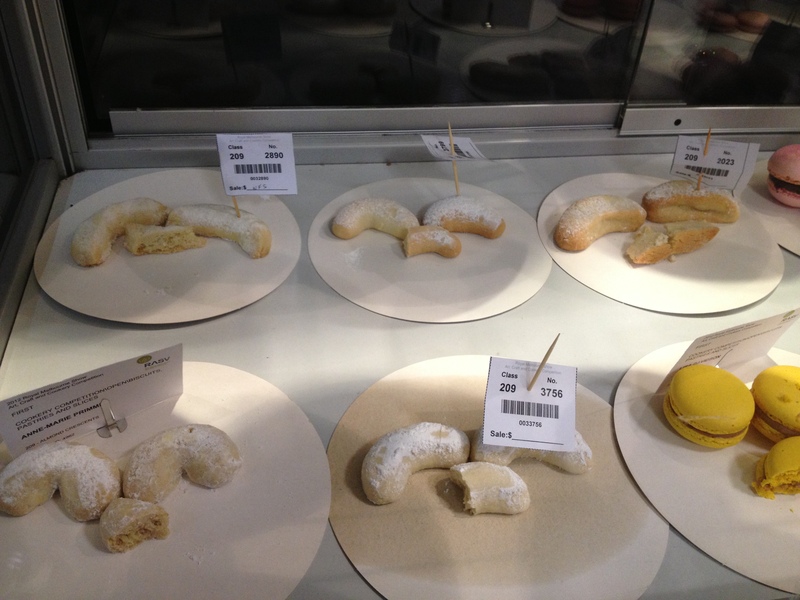 Primmer – you entered the same biscuits last year! Oh look, Anne Marie Primmer again in the almond cresents. I think that once you’ve won a certain number of times in a category it’s time to hang up the whisk. Look at all those carrot cakes, oh wait, Primmer again. C’mon judges this is a farce, the same person can’t possibly win year after year after year. I love entering this competition, don’t get me wrong and I’m already looking forward to next year. I just think it needs to be slightly modernised and it needs to be about produce and taste. The rules by which the entries are judged should be clear and specific and it should be about modern aesthetics, just a little. My sponge should be deemed worthy if yellow with the rich fresh eggs I choose to use and my entire cupcake eaten cause it beggars belief a cookery competition means not tasting. People should be encouraged to express themselves using both old and new techniques and whilst I love not losing time old recipes and tradition, I think the Fleay’s and the Primmer’s need to start making way for a new bunch of cooks. I would love to be privy to the judging and think more should be done openly or at least feedback given if requested. Next year I’m entering a sponge not because I think I’ll win but in protest against custard powder and one family having a monoply on show baking. I like to bake. 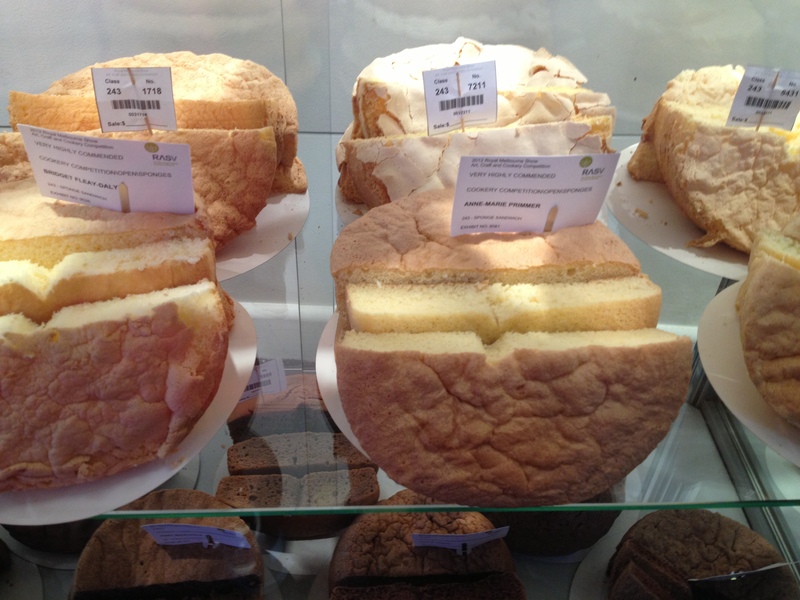 I am a Business Analyst that spent time studying patisserie. I choose the Stones over the Beatles and I find shopping online relaxing. I am happily married with 2 boys. I live in and love Melbourne. Great blog. 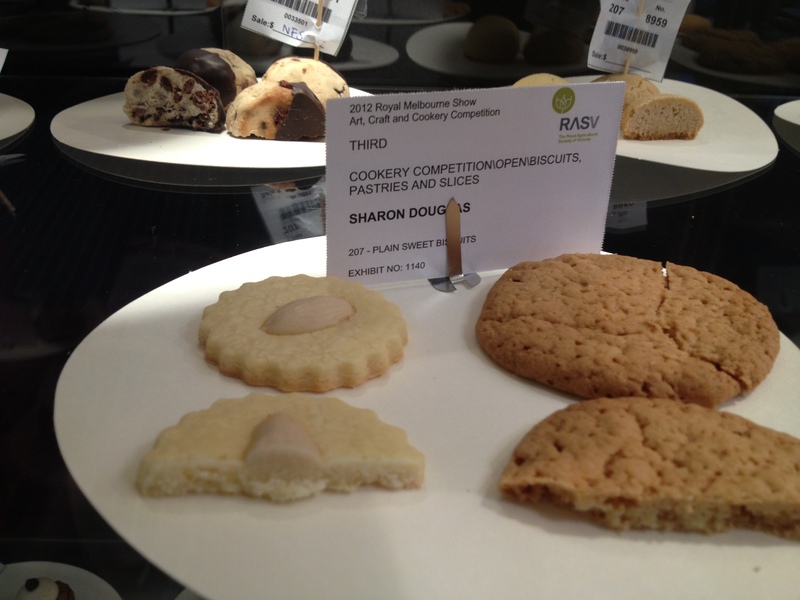 I didn’t make it to the show this year, but last year I looked at the cooking competition pieces and was underwhelmed by the standard of quality of the winning entries. Good luck for next year and well done for giving it a go. Thanks for your comments Angela. Perhaps I should purchase the book you mentioned, it may provide insights? To qualify my comments, I didn’t actually enter this year, I had a lot of work commitments that got in the way of me getting all my planned baking done. I would love feedback from the judges from the 2 previous years I’ve entered, that’s my point. I sought it out after my 2nd year and nothing was provided about my entries specifically. Also, I no longer study at William Angliss, but would love to know who the judge is that is chosen from the students? I have 2 sons and have no issue with you teaching them how to bake, I think it’s great, you should be proud. 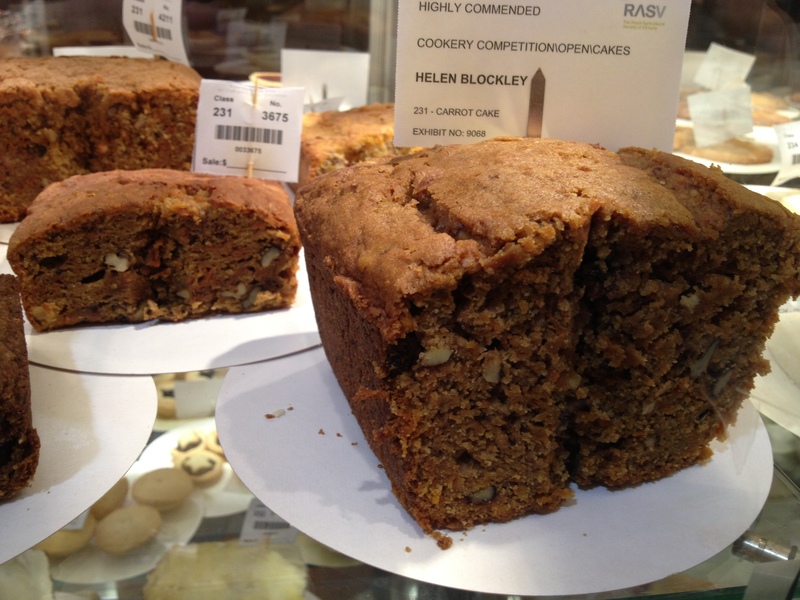 Whilst I thank you for your comments with regard to open judging on fruitcakes thus year I would love to see that on more than one item and at a time when people that are competing can be present. Perhaps you have no concerns about the judging because you always win? I don’t care if I don’t win anything I just want the rules to be clear and the same for everyone. Surely you must agree with my comments on biscuits and decorated cupcakes? I still think you should break the mould and use your friends very yellow eggs in a sponge, shake it up a bit. Hi Donna,the judge this year from William Angliss college was kristy Sampson.Different ones come over the years.Brendon Carter has been a great supporter and judge at the show in the past and still teaches at the college. Judges comments this year for cupcakes iced class 224- There is much confusion with this class and 225 “decorated” class.This class 224 is for soft icing or buttercream iced cakes with decorations using the same icing mixture. 225- Cup Cakes “decorated” Exhibitors are able to show their decorating skills in this class.Keep your decorations to a size suitable to the size of your cakes. Kristy Sampson Biscuits. Class 207&208- Asked for two distinct varietys/ mixtures overall four entries not distinct enough. Class 209(Almond crescents) overall lacking in flavour and to tough. I think if you would like more specific comments on individual entries then contact the RASV and suggest this to them.The organizers are always happy to receive feedback from the competitors. Purchasing the book I suggested would be a great idea it will be very helpful and is full of guidelines on how to prepare your exhibits to judging criteria.Another suggestion I have for you is to volunteer as a steward at a country agricultural show.This is a great way to learn about show baking and can be invaluable. Live/public judging is rotated over different sections each year.Last year was the novice cookery the year before bread and so on.Most years a huge crowd attends and is generally conducted at a time exhibitors can attend ranging from a weekend to a weekday.Even if you don’t have entries in these classes try and attend as they are very informative sessions.You never stop learning about baking.I picked up some useful tips at live fruit cake judging this year. I don’t always agree with the judges decisions but as I said you have to be able to accept their decisions on the day.The rules are clear(as you will find out from the book) and are the same for everyone.This is all part of competition cookery. Sometimes a judge will cut a decorated cup cake other times they will peel the cases down a bit and feel and smell the cake.They do have a good eye for the quality of the cake itself. 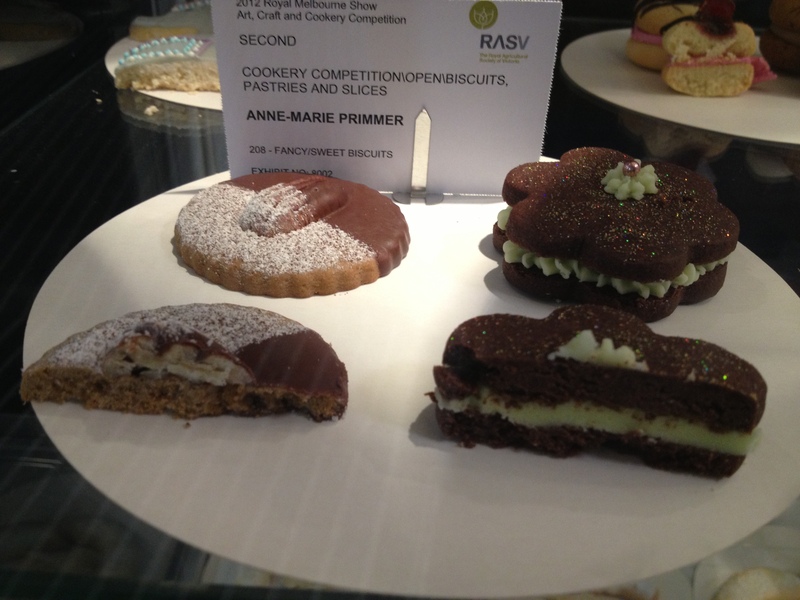 I guess I have been lucky to come from a competition cookery background and have learnt from the best but myself and Ann Marie primmer have worked very hard thru trial and error,asking questions,listening,watching and being positive to get to where we are today.I love passing my knowledge of show baking into others and often have fellow competitors come up to me at the show and ask questions about how they can improve their baking skills.I am more than happy to do so and get a lot of satisfaction from helping others.If you and yours friends would like to meet with me contact me on angelafleay@ yahoo.com to organize a suitable time. I have an absolute passion for baking and bake from the heart with a positive laid back attitude something I install into my children’s life skills. Baking is about having fun and enjoying what you do. I have reached a stage now where I am developing and sharing most of my own recipes.I rarely use a cookbook except when you have to follow a recipe set in a show schedule.I hope my comments are helpful and give you a better insight into the world of competition cookery. Thanks Angela, I’ll definitely get in contact and arrange to meet. I’d love to hear your insights first hand. I think you appreciate my genuine interest and curiosity and we can talk biscuits (my particular interest) in more details. I believe you also appreciate a good baker regardless of whether they have won a prize? I still think there are areas that can be modernized and brought up to date a little. Hi Donna, As I mentioned in my previous reply to your comments on essjayeats blog about the royal show cookery competition there is a book available to purchase”cookery for competition what the judges are looking for” which outlines the guidelines for competition cookery .Every year public judging is carried out for one section of cookery and preserves.A very useful and informative time where after judging you are able to ask the judge questions.This year fruit cakes were judged live by Ann marston who spent a good hour after judging giving advise.Other judges judged different classes. Each year a young judge comes from William Angliss college to judge( someone who teaches patisserie students such as yourself) Ann marston is a wonderful lady,full of knowledge and always willing to pass this on.Her comments regarding the use of custard powder in the article “the age sat 22 sept” have been taken completely out of context by yourself and essjayeats as have the ones about my use of supermarket purchased eggs(I use cage free or free range eggs purchased in the supermarket not eggs from my friends chickens .These lovely bright yellow ones I use in savory dishes,buttercakes,scones,etc….) Ann was merely stating the fact that if you use a published recipe containing custard powder to use a good quality one.Many recipes for sponges in baking cookbooks have custard powder in them.She didn’t say she advocated the use of or used custard powder in her own sponges.Take note the recipe to be used in the novie sponge class at the show DOES NOT contain custard powder. 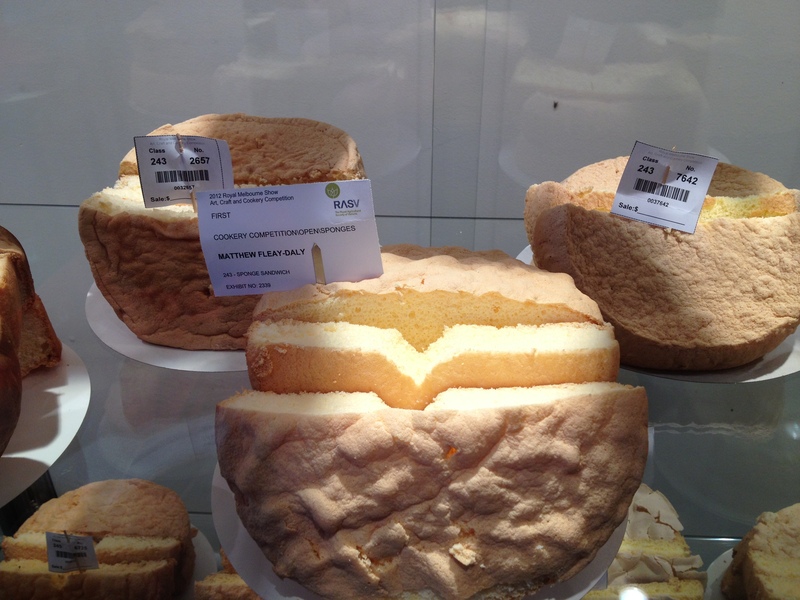 The colour of the sponge is only one of many criteria for judging sponge cakes.So many other things such as texture,flavour,lightness,execution,height of the two halves,etc… are taken into consideration when they are being judged. I am proud of my families heritage in competing at the royal show for five generations and even more proud of my children’s achievements this year.We don’t have a monopoly on show baking nor has Ann Marie primmer.We all have started at the bottom and worked tirelessly to improve our baking skills over the years.Both myself and Ann Marie go out of our way to give advice and help to fellow competitors and always will.I know when you allow the media into your life(as I have many times before and will continue to do so in the future) you are subject to scrutiny and people such as yourself are entitled to their opinion ,your comments won’t discourage me or my family from competing in the future.I was really pleased with the way Richard Cornish wrote both articles as have many who have read them and commented on how well written they were. For me it’s about upholding a family tradition as many other generations of families in other competitions(horses,cattle,woodchop,poultry and so on ) have done and continue to do.I love everything about the show and hope another five generations of my family enter in the baking competition!!!! On a final note when competing in any competition you must be able to accept the judges decision on the day. I have never Blogged on a website but feel the need to sort a few things out that are clearly wrong in your original message just recently and your one from last year which I also read. 1. 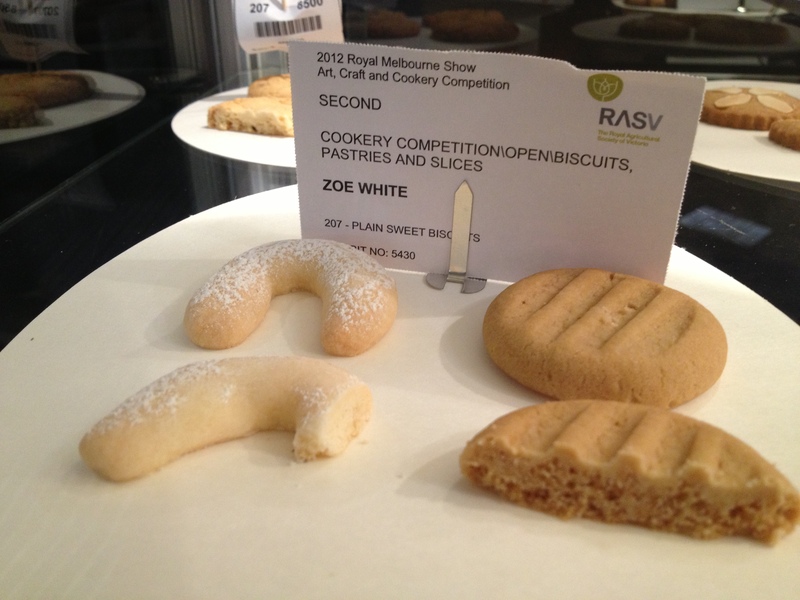 CWA DOES NOT run the cookery section at Royal Melbourne Shows as blogged. 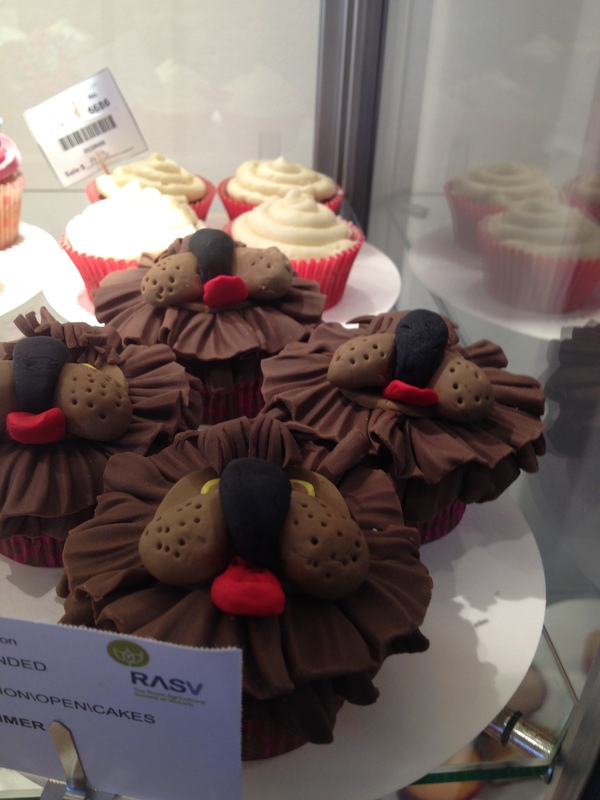 The RASV (Royal Agricultural Society of Victoria) runs the Royal Melbourne Show and is responsible for the various committees that run the show competitions..
2. There is over 700 exhibits to be tasted and judged on one day and there is a panel of judges (3 this year) from industry who are expert judges and their knowledge and experience is held in extreme high regard and some have travelled interstate for royal show judging. 3. With over 700 exhibits do you really think there is time to give each one a personal crit – don’t think so! Most of the judges wrote class comments as they were going around – that is what our job as stewards is – to write them down! 4. The Royal doesn’t give = places and does not give a second without a first. 5. The sponge class had 26 entries. Matthew did not beat 40 as mentioned in the Age (Ginger Fluff and Chocolate sponges are judged separate classes) and the sponge as with most classes are NOT STATE competitions. Anyone can enter – pay your money and enter and hope you win. The royal is a “Royal” show and I guess has that “Royalness” that goes with that. In the past we have received entries from interstate with the hope of winning a prized blue ribbon and the bragging rights I guess associated with that! But it is still a local show for competition entries apart from the VAS classes mentioned below. 6. There is novice classes where recipes are provided. Most open classes are your own receipes so if you want to use organic carrots you can or some have recipes that are to be followed. Novice classes are also open to people who have not won a first prize at a Royal Show. 7. Two classes – VASA Rich Fruit Cake and VASA Junior Boiled Fruit Cake are the only 2 classes that you must enter through your local show and then cook your way through to State Final which is held at the Royal every year – see Victorian Agricultural Societies Australia for more information or contact your local show society (there are 133 in Victoria). Closest to Melbourne would be Whittlesea, Dandenong, Berwick, Lilydale to name a few. 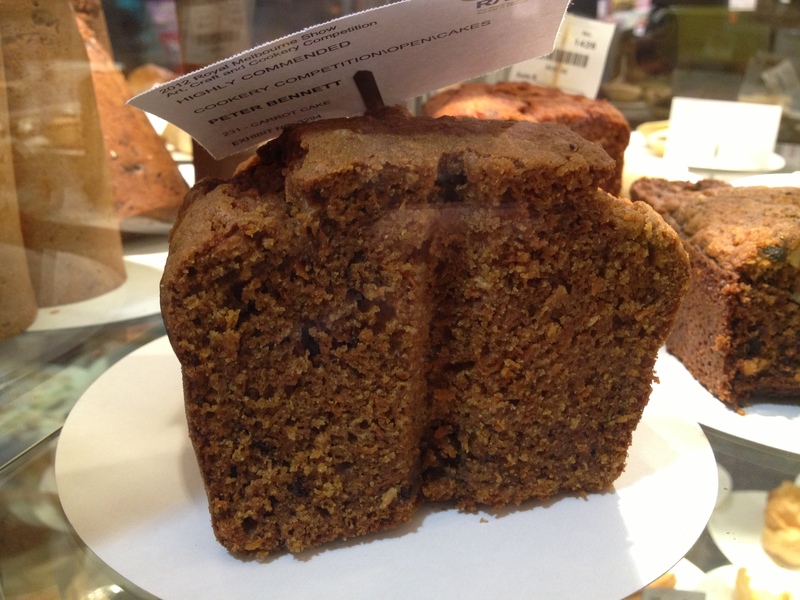 The VASA State fruit cakes were displayed in the foyer this year. 8. The Age is given I believe names from the office for press stories every year and everyone loves a cookery story (he also interviewed Janet McDonald) and the Herald Sun ran a story on Anne Marie Primmer. The amount of entries that Anne Marie Primmer, Janet McDonald and Angela Fleay put in clearly show these women love cookery as well as being friends and competitors! They enter a massive amount, most are entered in each class, they are happy to share knowledge and only encourage other competitors and win so they must be doing something right! 9. 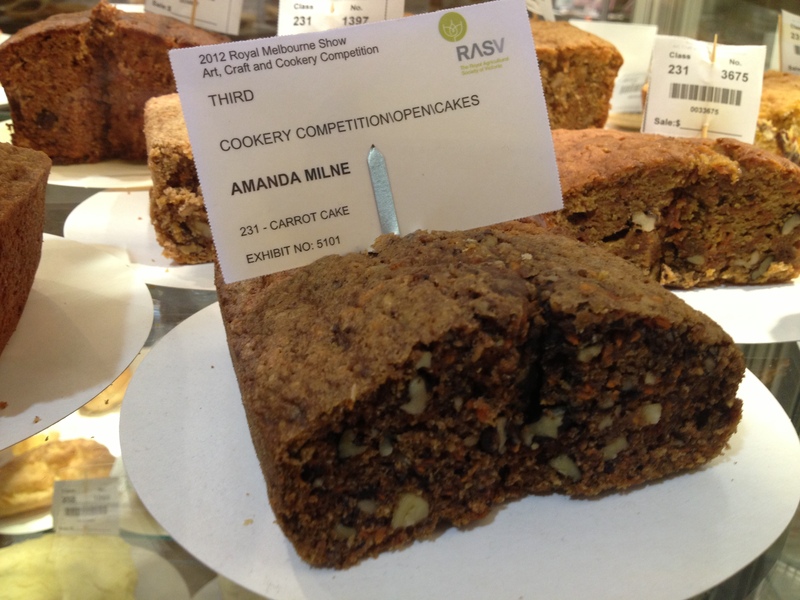 I have stewarded in cookery at the Royal Melbourne Show for 8 years and my local show for over 20 – if you want to learn about show cookery get in touch with your local show society – most are screaming out for volunteers and a great way to learn. At the royal this year all fruit cake classes were live judged (again, a great opportunity to listen and get some tips of fellow competitors and judges). 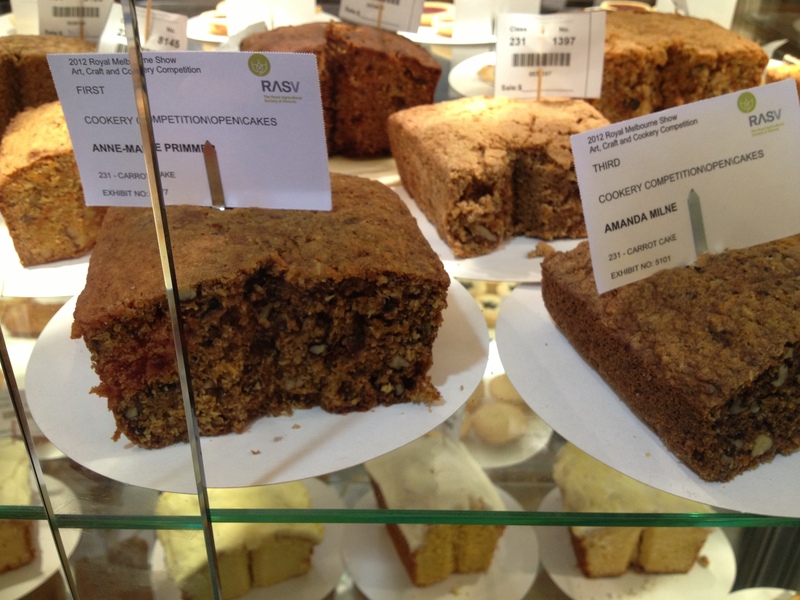 Usually if you read your Schedule the cookery section is broken up into subsections such as fruitcakes – This year 5 fruitcake classes were live judged not just one. 10. Read your schedule – the amount of disqualifications of entries for not reading the schedule for numbers, tin size etc is amazing. You will be pleased to note – Angela’s children’s rumballs in junior cookery section were not judged in their class as there was only 4 on the plate instead of 8 so were disqualified – so even the best do make mistakes! 12. The Show cookery section isn’t about promoting Victorian produce and free range everything that is what “The Taste of Victoria” pavilion is all about and commercial cooking competitions which run as part of the lead up to the Show. The cookery section is about “Home” Cooking (Definition is : No commercial mixes or equipment to be used. Home made only. No ring tins.) It is encouraging everyone to enter, adults and junior cooks to whip up a batch of scones or sponge or plate of bickies and the fun of entering. 13. The judges DO NOT KNOW who the competitors are. All the Exhibitors are randomly numbered and the judges sheets that we as the stewards compete are generated once the barcoding of entry delivery is complete so we are not wasting time looking for exhibits that did not get cooked! 14. The Arts and Crafts Pavilion is staffed mainly by a volunteer committee who give up countless hours, attend meetings, work in the lead up to the show, some fulltime over the show fortnight in setting up exhibits across the pavilion and come to the show from across the State to volunteer and I for one am offended by such a blog as yours was. In summary I think your blog should be promoting people to enter their best cookery and support the show – not to discredit the winners or to come across as sore loser which I personally think yours has. That I guess is the thing with blogging, just cause it is your opinion doesn’t have to mean we all have to agree! Good luck next year. Thank you for taking the time to read my blog and for providing such a thorough and detailed response to my recent post. I’m not sure what has offended you? If anyone should be offended it could possibly be Angela, but she has been nothing but gracious and I believe agrees that her and I might disagree on some points but we both love baking, so you know, live and let live. You seem awfully spiteful, and blogging is a self published independent form of expression, so I stand by my piece but I also happily stand corrected on any facts that are not correct, as you have thoughtfully pointed out. I do take particular offense to being called a “sore loser” especially when I never entered the show this year. I think all competitions should come under scrutiny and feel that if you were actually a nice person you wouldn’t slant your feedback in a fashion that is trying to ridicule me. Ok, you know more me than me, congratulations. Surely it’s people with your attitude that fit the stereotype of the type of person running these competitions that makes us “newbie’s” not want to enter. Frankly you don’t seem very nice.